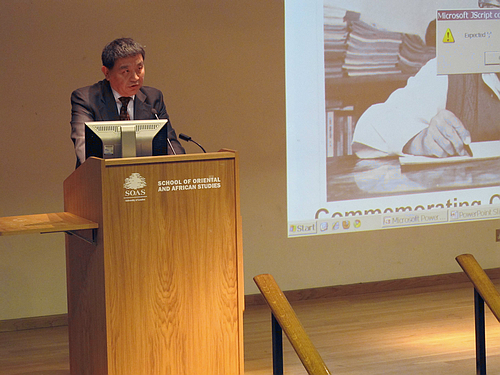 Minister Counselor Wu Xun Inaugurates the "Photo Exhibition in Commemoration of 100th Anniversary of Cao Yu"
On February 10, 2011, the photo exhibition in commemoration of 100th anniversary of Cao Yu entitled "Cao Yu: Pioneer of Modern Drama in China" was opened in SOAS University of London. Minister Counsellor for Culture Wu Xun of the Chinese Embassy, President Zhang Xinsheng of Confucius Institute, Professor Li Ruru of the University of Leeds, Lady Youde and over 100 other important guests from the cultural circle, including those from the British Council, the British Museum and the British Library attended the opening ceremony. Minister Counselor Wu Xun inaugurated the exhibition and delivered opening remarks. He said that the importance of Cao Yu to modern drama in China is just as the importance of Shakespeare to British drama. People love Cao Yu's dramas because his works keep abreast with the times, and from them people see what is unique to an era, a spirit of time and the eternal values it contains. People study Cao Yu's dramas because his works are a microcosm of how drama evolves in China. 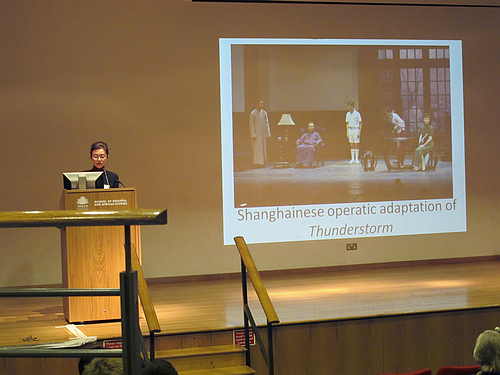 By reviewing the revision and evolution of classics such as "Thunderstorm" over the past 70 years, we can clearly see that how modern drama in China developed all the way. 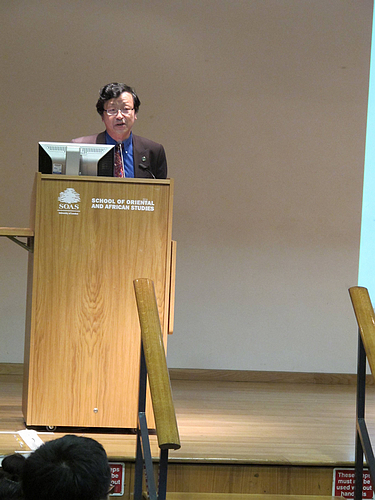 Minister Counsellor Wu said the drama industry is booming in China. It is one of the most popular forms of performing arts in the large and medium-sized cities in China. In Britain, on the other hand, drama has a long history. Many of the works of Shakespeare are popular and well-known around the world. 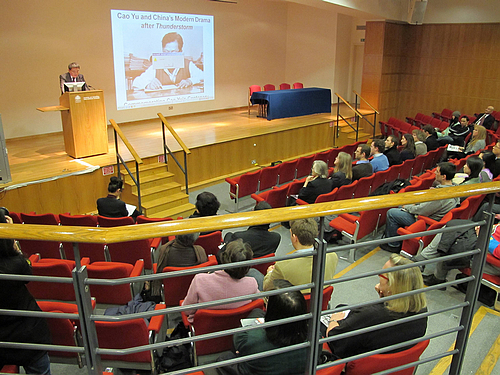 There is still a great potential for the two countries for exchanges, cooperation and studies in the field. 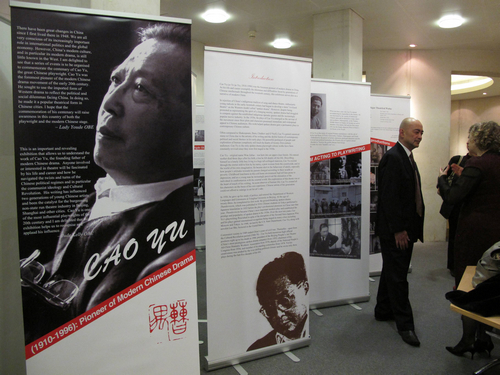 In addition to the photo exhibition and reception, the activities that evening also included a lecture on the life of Cao Yu and his works and the film "Thunderstorm". 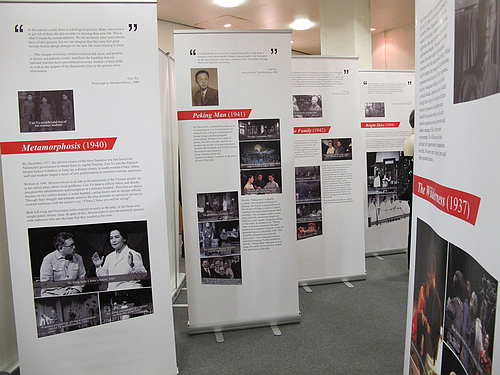 According to Li Ruru, organizer of the activities, the "Cao Yu: Pioneer of Modern Drama in China" photo exhibition will also be held in Leeds in March. In addition, in support of the commemorative activities for the 100th anniversary of Cao Yu, the University of Leeds will also organise students to rehearse Cao Yu's dramas and the premiere will be on the evening of March 21 in the Leeds Grand Theatre.